ENTRANCE HALL With composite double glazed front door; radiator; built in cloaks cupboard. SITTING ROOM 16' 8" x 11' 0" (5.09m x 3.37m) Two radiators; fireplace; fitted carpet; bay window to front aspect. INNER HALLWAY with laminate flooring; airing cupboard housing the central heating gas fired boiler. BEDROOM ONE 14' 2" x 9' 6" (4.32m x 2.90m) Wood effect vinyl floor covering; radiator; window to rear aspect. BEDROOM TWO 10' 11" x 9' 2" (3.34m x 2.81m) Wood effect vinyl floor covering; radiator; double style French doors to the rear garden. BATHROOM Suite comprising of W.C; pedestal wash basin; panelled bath with mixer tap and shower attachment; radiator; window to side aspect. 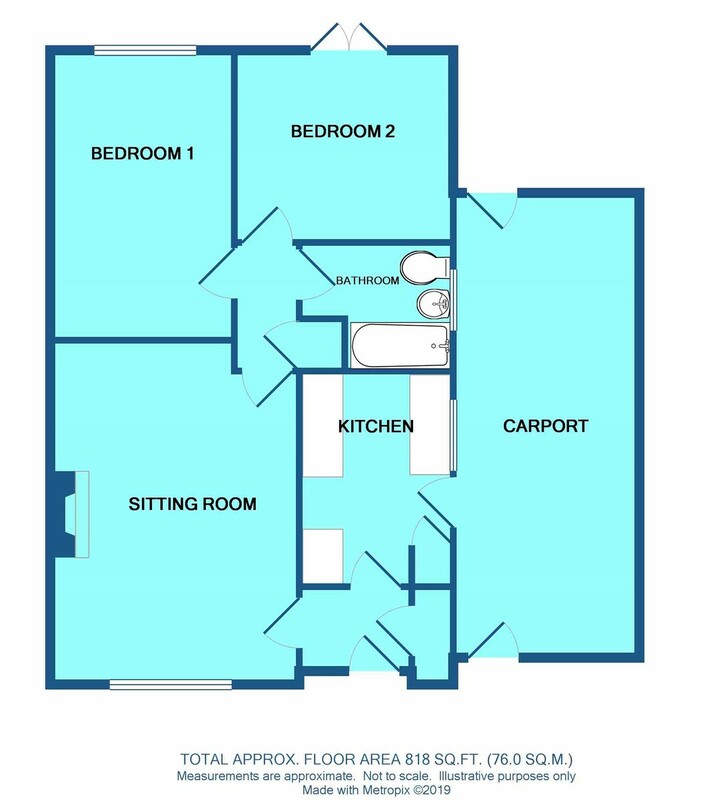 KITCHEN 10' 3" x 7' 6" (3.14m x 2.30m) Fitted wall and floor cupboard units with work surfaces over; space for gas cooker; plumbing for automatic washing machine; built in pantry; windows to side aspect and door leading through to carport. CARPORT 22' 9" x 8' 10" (6.94m x 2.71m) The carport is enclosed (currently fixed boarded access) Restricted access to the front, door through to the garden and door through to shed/workshop.